We know that America has widening income inequality. The rich are getting richer, and wages have been stagnant for everybody else. We also know that fewer Americans have access to defined benefit pension plans, putting more of the burden of saving for retirement on individual employees. Are these two trends compounding each other? The short the answer is no, this is not happening. As I argue below, this is mainly due to our investments in progressive programs like Social Security and Medicare. The transition from defined benefit to defined contribution plans has been going on in the background, and it may seem at first blush like this transition could increase inequality, but that would be a misread of how the plans work. First, consider the logic. Both defined benefit and defined contribution plans award benefits as a percentage of salary. Consider two workers in the same firm, a low-paid manual labor and a higher-paid executive. If, over time, the salary of the executive rises faster than that of the manual laborer, their retirement wealth will also become skewed as well. But crucially, this would happen in direct proportion to the change in salaries, regardless of plan type. Under either a defined benefit or a defined contribution plan, the executive gets a higher retirement benefit in direct relation to his or her higher salary. If anything, the above example might be under-selling things a bit, because it assumes both types of workers stay with their company for the same length of time. Traditional defined benefit pension plans reward both high salaries AND long tenures, and we know that higher-paid executives have much more employment stability than lower-paid manual laborers. In this scenario, the manual laborer would be better off in a front-loaded defined contribution plan than a back-loaded pension plan. The politics of this are confusing, since liberals tend to be the ones defending defined benefit pension plans, but there’s nothing special about them in this regard. Traditional pension plans are not inherently progressive. In fact, so-called “teacher” pension plans tend to reward higher-paid school administrators over more transient, lower-paid teachers. Ok, enough with the theory, what do the data show? Retirement wealth is a function of participation and contribution rates. Once you combine both types of plans, workers are no more or less likely today to participate in a retirement plan than they were 30 years ago (see Figure 20 here), and total retirement savings has also kept pace. That is, the type of retirement plan has not dramatically changed our collective retirement preparation. In terms of results for individuals, earlier this year I wrote about a paper from Adam Bee and Joshua Mitchell from the U.S. Census Bureau. Among Americans age 65 and older at the 25th percentile in terms of income, they found income gains of 31 percent from 1990 to 2012. For those at the 75th percentile, the gains were similar, at 32 percent. They also found that poverty rates among those 65 and older declined from 9.7 to 6.7 percent. To be sure, these stats do not prove that there is no inequality in retirement wealth, only that we’ve provided retirees with some buffer against it. Namely, Americans over age 65 have a giant social safety net through Medicare and Social Security. To show just how important Social Security is, consider the chart below, from the Federal Reserve. The first two columns show that the top 5 percent of households have about 13 times the income as the bottom 50 percent of households, and about 110 times (!) the retirement wealth in the form of DB and DC retirement plans. That is, wealthier people have much more in the way of retirement assets than lower-income people. This has always been true, and income inequality is making these trends worse. But look at the last column, which compares total retirement wealth (including Social Security) with income while working. As a ratio of retirement wealth to wealth while working, the bottom 95 percent is doing ok, mainly because of Social Security. Unlike our other forms of retirement savings, Social Security is explicitly designed to be progressive, and it is effectively providing a floor of retirement benefits and keeping retirees out of poverty. It’s possible that defined benefit or defined contribution plans could be designed more progressively. Defined benefit plans could provide a floor of benefits to all workers, for example, or award proportionately higher benefits for lower-paid workers. Defined contribution plans could be framed in terms of level-dollar amounts for each worker, as opposed to a uniform percentage rate which benefit higher-paid workers more. But these elements are rare, and in fact the opposite is more common, where stable workers get extra rewards for their stability and transient workers lose out. In the teacher space, many states give extra perks to teachers or administrators who reach thresholds like 20 or 25 years of service. Those are another way states have made their teacher pension plans regressive, not progressive, and they're not even effective as retention tools. Worse, more than 1 million teachers don’t have access to Social Security, leaving them particularly vulnerable to poorly designed retirement plans. All told, fewer older Americans have defined benefit pension wealth, and the poverty rate among elderly Americans has fallen dramatically. Both things can be true at once. As we have written about before, female educators in Illinois earn on average $7,775 less than their male colleagues. This disparity in salary translates into average annual pensions that are $3,800 less valuable. In a recent blog post, I found that at least some of the salary and pension gap is derived from the fact that most female educators work in elementary schools, which have lower average salaries compared with high schools where most men work. In this post, we will look into whether different rates of educational attainment among men and women contribute to the salary gap. This is an important question since in most school districts teachers can earn a significant salary increase, the so-called “master’s bump,” once they earn their master’s degree. To do this, we looked at the rate of female and male educators who hold at least a master’s degree at each year of experience, and then we compared that trend to the salary data. In both cases, higher numbers correspond with a gap favoring male educators, while lower numbers represent a gap favoring female educators. As shown in the graph below, there’s a gender salary gap (the orange line) even among educators with one year of experience, and the gap steadily increases over time, and growing to $12,567 among those with exactly 30 years of experience. The pattern on educational attainment (blue line), on the other hand, shows a different trend: women tend to hold master’s degrees at slightly higher rates at most experience levels. Source: Author’s analysis of data from Illinois Teacher Service Record (TRS) 2012. Data adjusted for cost of living using the Comparable Wage Index. These data show that men with six or fewer years of experience have slightly higher educational attainment, but after that the advantage goes to women. One might expect that with higher educational attainment, women’s salaries would be higher. But no, men have higher salaries at every experience level despite having worse educational credentials. The higher rate of educational attainment for women is insufficient to overcome other barriers to higher salaries, such as working disproportionately at the elementary level. In the end, educational attainment does not explain why there is a large and persistent pay gap between male and female educators in Illinois. We will further explore other features and potential explanations of the gender-pay gap in future posts. Do Teachers Get Paid Over the Summer? Teacher pensions are complex. This post is a part of series to answer the most common questions we get. To submit yours, email us at teacherpensions@bellwethereducation.org -- we’ll try our best to answer. One of the most common teacher salary questions is whether or not teachers get paid over the summer months. So, do they? Not the most satisfying of answers but, it depends. Teacher payroll schedules vary district-to-district: some allow workers to spread their 10-month salary over 12 months, while others don’t give any paycheck during the summer months, requiring teachers to budget, or in some cases, get a second job. Below are the public teacher pay schedules for the nation’s 20 largest* districts (as of July 2018). To compile them, I checked state payroll offices for pay day calendars and information regarding summer pay. It was surprisingly challenging to pull some of this data, and I ended up having to call payroll offices to clarify in some cases. Some districts don’t make this information readily available until a teacher is officially in the hiring process, further demonstrating why this is such a common question. In general, most teachers are either automatically paid throughout the course of a year or have the ability to opt into a program that redistributes their pay for them. But a few districts, like Montgomery County, Maryland and Charlotte-Mecklenburg, North Carolina, reported paying teachers on 10-month schedules. Teachers are paid twice a month for 12 months. Teachers are paid once a month for 12 months. Some instructional roles are 10-month positions, others are 12-month. Twelve-month employees receive 26 checks a year, and 10-month employees receive 21 checks. Most teachers are paid on a 10-month schedule. A few specialized instructional roles work on a 12-month schedule and are compensated accordingly. Twelve-month employees receive 26 checks a year, and 10-month employees receive 21 checks. Ten-month employees may opt in to a deferred payment plan to distribute 10-month salary over 12 months. Most teachers are paid bi-weekly on a 10-month schedule, but may opt into a Year Round Pay program to distribute 10-month salaries over 12 months. A few specialized instructional roles work on a 12-month schedule and are compensated accordingly. Teachers are paid on a 12-month schedule. Twelve-month employees receive 26 checks a year. Teachers are paid bi-weekly on a 10-month schedule, but may opt into an Extended Year Pay program to distribute 10-month salary over 12 months. Most teachers are paid bi-weekly (beginning on the third week of their work year) on a 10-month schedule. If requested on or before the last day of preplanning, 10-month teachers may opt in to a deferred payment plan. A few specialized instructional roles work on a 12-month schedule and are compensated accordingly. Most teachers are paid once a month for 11 months out of the year -- a few specialized instructional roles work on a 12-month schedule and are compensated accordingly. Teachers are paid once a month for 10 months. Teachers may opt into a Summer Cash Savings Account program to redistribute their salary over 12 months. Most teachers are paid on a 10-month schedule. A few specialized instructional roles work on a 12-month schedule and are compensated accordingly. Teachers are paid once a month for 10 months. Similar to teacher pension systems, teacher salary schedules and payroll calendars can vary dramatically across state and district lines. This variance, coupled with the level of opacity around district’s individual policies, can impede teachers from making informed decisions about their careers. *The Department of Education of Puerto Rico is the fourth largest school district. Teacher payroll calendars were not immediately available for the district at publication time. I'm a Public School Teacher. When Should I Retire? Although the decision about when to retire is a personal one involving many factors, in most states there is a very clear window during which you can maximize your retirement wealth. As explained below, you can receive the most total money in pension benefits by following two rules: stay in the same pension plan for as many years as possible, and then retire at your state’s normal retirement age. In the 401(k)-style plans common in the private sector, your pension wealth is tied directly to your contributions, the contributions of your employer, and the investment returns earned by these contributions. In most states, however, public school teachers receive a Defined Benefit (DB) retirement plan. In these plans, pension wealth is instead tied to a formula that calculates a monthly defined benefit based on years of service in that retirement system and final average salary (usually calculated as your average salary over the three to five highest-earning years of your career in the system). These two numbers are then multiplied together, and a small percentage of that factor — usually around 2% — becomes your monthly defined benefit. These pension rules offer some clear guidelines about how to maximize your pension wealth. First, you should work as long as you can in one system. Because your defined benefit is calculated based on years of service in a system, switching systems will most likely leave you with two small benefits that, when combined, are less than the one large benefit you would have gotten if you had remained in one plan for your entire career. In addition, you should not retire earlier than the normal retirement age. In California, for example, the normal retirement age is 62, meaning that a teacher who retires at that age receives a benefit based on the 2% formula multiplier. However, if you retire at the age of 55 — the earliest possible retirement age — the state will instead use a multiplier of 1.16% to calculate your pension benefit. Finally, avoid retiring much later than the normal retirement age. You get your pension benefit in the form of yearly payments rather than as a lump sum of cash. This means that as you age, even if you receive a higher amount of money per year, you will have fewer years of life to receive these payments. With an understanding of this pension structure in mind, you should be able to make an informed decision about what retirement age is best for you and your family. For more information about your state’s pension plan, check out our state teacher pension plans page here, or look at your state pension plan’s member guide that can be found at your plan’s website. And for more information about how to calculate a teacher pension, read our explainer post here. How Do You Calculate a Teacher Pension? Teacher pension systems can be quite complex. There are specific rules that vary state-to-state that affect any given teachers’ annual pension benefit after retirement. There are wider contexts to consider as well. For example, in some states teachers are not covered by Social Security, unlike most employees who can count on Social Security on top of their 401k or pension once they retire. Add all this together, and it can be challenging for teachers to have an accurate sense of how their annual pension benefit is calculated and, in the end, determine the value of their yearly retirement. So how are teacher pensions calculated? The first thing to know is that most states have a minimum number of years of service teachers must meet before they are even eligible for a pension, also known as a vesting period. As such, teachers must work a minimum number of years, often five or ten years, to actually qualify for a pension upon retirement. If teachers leave before meeting that threshold, when they retire, they’ll only receive the money they’ve personally put in and, in some cases, a bit of interest on that investment. 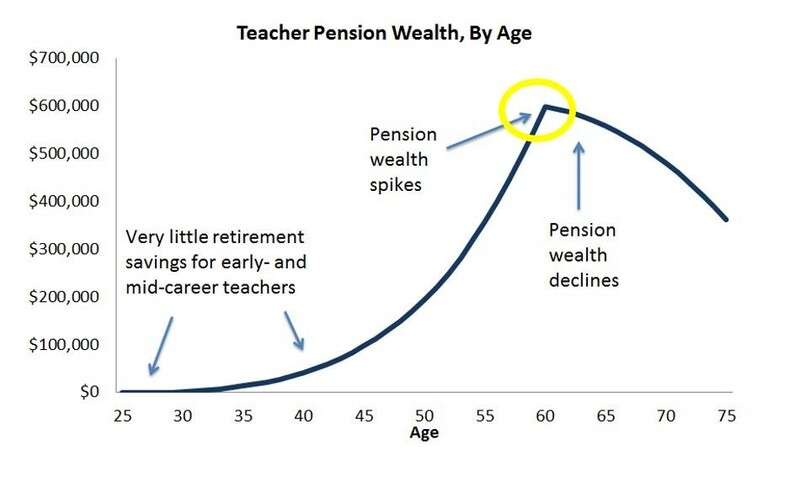 For those educators who work beyond the vesting requirement, traditional pensions are based on the teacher's years of experience and a measure of "final average salary," usually the average of the teacher's salary in the last three or five years prior to retirement. In general, the longer a teacher has worked and the higher her salary, the higher her pension will be. There is one more factor: a state-set benefit "multiplier," typically around 2 percent, that literally multiplies all of these variables together to determine how much a teacher will receive yearly during retirement. That's not all. States also set a minimum retirement age, before which teachers can’t access their pension benefits, and years of service requirements that teachers must meet to receive full benefits. For example, some states employ the "Rule of 80," which sets the retirement age as the point when the sum of an educator’s age and years of service add up to at least 80. States also set early retirement ages, at which point workers can collect reduced benefits. How much early retirement affects benefits varies by state. Researchers have found that traditional teacher pension benefits are back-loaded in that most of their value comes as the teacher nears the normal retirement age. That happens because pension plans use the "final average salary" in the years they were earned; they do not adjust for inflation, and someone who leaves the profession years before collecting a benefit will see their pension gradually wear away to inflation. As a result, teacher pension plans typically provide generous retirement benefits only to those who teach for multiple decades. On the other hand, those with shorter careers receive scant, and in some cases, no pension benefit. What is the state’s vesting period? In other words, how long do you need to work before you will qualify for a pension? How much are you contributing per month to your pension? How much does the state contribute on your behalf on top of that? Are you enrolled in Social Security, or are you solely dependent on your pension and your own personal savings? If you’re a new teacher, does your state offer alternative retirement plans that might be more portable than the traditional pension plan? Generally speaking, due to how pension systems are designed, only about half of teachers ever earn a pension. Instead, they only receive their own contributions made to the pension fund. Among those who do earn a pension, only those teachers who spend most of their careers working in the same state are the true "pension winners." Current and prospective teachers, particularly those living in states with other retirement options, should think carefully about which retirement saving strategy works best for them. Even though most educators are women, their salaries nevertheless lag behind their male colleagues. In a recent report, I analyzed educator salary data in Illinois and found that women – at every experience level – earn lower salaries than men. On average, a female educator earns $7,775 less than her male colleagues. The problems don’t end there. These lower salaries translate to lower pensions as well. The typical female educator’s annual pension is valued at $3,800 less. Unfortunately, finding a gender pay gap isn’t altogether surprising. However, it does mean K-12 education isn’t inoculated to gender-based disparities by district salary schedules that regulate how much educators can earn based on tenure. So what might explain these gaps? Although there no perfect answers, through a series of posts I will look into potential causes. Today’s piece is about differences across grade levels. Aside from the “parenting penalty” that disproportionately and adversely impacts the earning potential for women, one reason women on average earn lower salaries and pensions is that they work overwhelmingly at the elementary level. The majority of men, on the other hand, work in high schools. As shown in the graph below, average salaries are significantly higher in high schools than in any other grade span. Source: Author’s analysis of data from the Illinois Teacher Service Record (TSR), 2012. Data adjusted for cost of living using the Comparable Wage Index. Around three-quarters of all educators in Illinois are women. And among women, 42 percent work in elementary schools, while only 17 percent work in high school. Comparatively, 47 percent of men work in high schools. This distribution contributes to the gender-pay gap among educators in Illinois. This may be due to greater extra earning opportunities at the high school level through clubs and athletics. Or, there could be a higher concentration of advanced degree holders in the upper grades. Illinois also has the most single-school districts in the country, which have significantly higher costs. It is possible that a disproportionate number of these districts may be comprised of high schools. We will further explore features and potential explanations of the gender-pay gap in future posts.